Serious discussions concerning the development of a South Asian hydrocarbon corridor began with the dissolution of the Soviet Union and the introduction of newly independent, resource-endowed states to the global energy market. Newly sovereign Turkmenistan, which, according to the U.S. Energy Information Agency, is the 6th richest state in terms of natural gas reserves, immediately became an attractive option for the supply of gas to the energy-deficient states of South Asia. Given its potential for supply, as well as its geographic proximity to demand centers, Turkmenistan was envisioned as the sourcing point for a proposed natural gas pipeline which would extend through Afghanistan, Pakistan, and terminate in India. TAPI, as this project remains called, was to be an avenue by which energy security, economic development, and inter-state cooperation might all be facilitated. Why then, two decades after the original conceptualization of this project, and in an area where hydrocarbon commodities are badly needed, has TAPI yet to be realized? ….this supply [of gas] will not offer the economies of Pakistan or Afghanistan balanced or universal, population wide development. In addition to doubts that TAPI will receive sufficient investment or that the gas field that would feed it, the Daulatabad, may not be as ample as initially thought, there remain far more vital concerns as regarding the success of this project. Examining the region, it is acknowledged almost universally that the security situation in Afghanistan poses the most significant threat to all ventures concerned with the installation of vital, and vulnerable, mass infrastructure. However, the challenges which this region faces are far more complex than the presence and operations of violent actors. These challenges may be framed as follows: economic fragility, threats to peace, and the non-consolidation of healthy political systems. Yet, despite being an argument not found in public discussions concerning the TAPI project, the fact remains that the construction of a pipeline addresses precisely none of these challenges and, if not developed within a clear regulatory and legal framework, may even serve to further exacerbate the concerns already facing parties invested in the future of South Asia. Thus considered, allow this report to serve as a cautionary brief. The following is an enumeration of three critical realities that require recognition by any party acting or desiring to play a role within this region. 1. Economic development does not equal economic well-being. In the states under examination, Afghanistan, Pakistan, and India, there exists a severe shortage of hydrocarbon resources which, speaking especially of the first two, has significantly hindered economic growth and development. In this sense, access to natural gas is indeed critical. However, this supply, in and of itself, will not offer the economies of Pakistan or Afghanistan balanced or universal, population-wide development. GDP, both raw and per capita, may increase, but this would, at most, be only marginally reflected in the standard of living of the majority of the populations of these states. According to the CIA World Factbook, Afghanistan and Pakistan are countries in which nearly 20% and 40% respectively of the populations are engaged in the agricultural sector and equally large percentages are involved in non-market occupations. Therefore, natural gas, which will be transported to cities and industrial centers, will not necessarily grant these percentages of respective populations many concrete opportunities to improve their condition. Furthermore, at least to date, there exist no frameworks by which state governments would share resource rents for the purpose of universal, micro-development, and other investments into human well-being. In countries such as Afghanistan and Pakistan, this uneven distribution of wealth, especially to the peripheries, has engendered nationalist movements, ethnic and regionally based opposition, and has left certain groups of the population with little choice but to depend upon non-state actors and sub-market means in order to provide for themselves. This has proven to be particularly dangerous. Looking at the above map, the proposed path of the TAPI pipeline will run through Afghanistan’s Kandahar Province and Pakistan’s Balochistan Province and will require the appropriation of land from populations which are the poorest within their respective states and, connected with their poverty, these are the populations (the Pashtuns and the Balochs) which have had significant grievances with the government. Further, these grievances, which are responses to civil and economic human rights abuses, have often expressed themselves violently. 2. Security is not a synonym for peace. When illustrative definitions of the term “security” are offered, resulting conceptualizations typically involve either a fort or a fence. Afghanistan and Pakistan, whose security is threatened by the activities of armed actors, therefore employ either one or both of these two models of security – the guns, or the fences. Fences, literally and metaphorically speaking, are effective mechanisms for creating two distinct groups, placed at odds with each other and competing for resources that have been left with one faction or the other. One side of the fence, presumably on the side of the group that constructed the fence, will have more abundant, or more valuable resources. When the well-being of the group on either side of the barrier, whether this barrier is physical, socially constructed, or legal, is threatened, and when one group perceives that conditions on the other side are better – there will be conflict. …when one group perceives that conditions on the other side are better – there will be conflict. And so, how does one defend this fence? These boundaries between competing groups are defended with force. It is an oft repeated pattern throughout history and the practice of hard-power, allegedly “rational” foreign policy: the more hard-power, the more guns – the more secure one becomes. This perception of security has always been of acute concern. It is fundamentally flawed since, more often than not, both groups separated by this fence have access to instruments of hard power, i.e. each group has the capability to engage in violent action. This does not lend itself to an atmosphere of security. In respect to the cases currently under examination, exploited, marginalized, oppositional groups vis-à-vis the center exist in all countries along the route of the TAPI pipeline. It would be dangerous to ignore the fact that the route of the pipeline passes precisely through two major zones of conflict: Kandahar and Balochistan Provinces; both are territories in which populations live at odds with their respective central governments and in which violence has broken out repeatedly for decades. As long as both groups of actors, on either side of the fence, perceive that violence is the only effective way through which to achieve their aims, violence will, of course, continue. This is precisely the case currently observed. The security forces of Afghanistan and Pakistan are both numerous, expanding and well-equipped. Judging by the reports of news media sources focusing on the region, violence does not seem to be abating. According to the 2013 UN report on the situation in Afghanistan, there was a significant rise in civilian casualties in the first three months of the year compared to 2012. With coalition forces withdrawing and reevaluating their tactical role in 2014, it is questioned whether or not the population of Afghanistan can be protected. Yet, regardless of how well security forces are able to secure the state and population from violent actors, which is highly hypothetical, this in no way can be considered peace because even a forum for dialogue between the parties is lacking in substance. Pakistan experienced the lowest level of political violence during the 1990s, a period in which there were multiple factions, including a party from Balochistan, represented in Parliament. Despite the fact that violence continues and populations are still at risk, the model of militarization and weaponization of the state is still being used as the primary approach among these nations. Pakistan’s experience should prove illustrative of the failure of even a highly militarized, “secure,” state to constructively address and stem violence. Taliban forces operate on both sides of the Afghanistan/Pakistan border. Balochistan remains a region whose fundamental grievances have not been addressed, and, in the months leading up to the Pakistani Parliamentary elections on 11 May, 2013, over 110 were killed, providing clear evidence that the situation current to Pakistani affairs cannot at all be defined as peaceful. This report holds that “stable” is a misleading term and a dangerous goal to target in respect to foreign and domestic political and defense policy. A lid, pressed tightly onto a pot of water can remain stable and seemingly undisturbed for quite a long time. However, eventually, and unpredictably, the pressure will be too much to contain. Thus, the notion that stability is the first building block necessary before building a government is a highly problematic policy short-coming. 3. Elections alone do not amount to a healthy political system. Following the Parliamentary elections in Pakistan, much of the commentary concerning the event can be categorized as belonging to three repeating lines of discourse; the resilience of the citizenry who voted despite the threat of violence, the triumphant return to political office of a man, Nawaz Sharif, who was formerly exiled, and the successful transition from one civilian government to another. While not discrediting the Pakistani people and the presumed legitimacy of election results (though fraud charges have already been leveled at Sharif), there remains a serious concern in respect to the lack of a true coalition, and thus the lack of a genuine dialogue between parties. There are regional actors whose concerns have yet to be addressed. As noted in a report by the Carnegie Foundation, Pakistan experienced the lowest level of political violence during the 1990s, a period in which there were multiple factions, including a party from Balochistan, represented in Parliament. Given the fact that enough of the vote was won by Sharif to give his party an outright majority in Parliament, it is feared that, since the conditions required of a political, multi-party dialogue are absent, violence may once again result. And, as an actor at the head of a party which is regionally affiliated (Punjab) has recently come back into power, champion-scale national projects such as a gas pipeline will provide a clear opportunity for the central government to assume resource rents and install into this project those loyal to the center, further strengthening the cliental structures upon which Sharif already depends. Rent from resources, and those industries which rely on the availability of natural gas, would be easily captured. 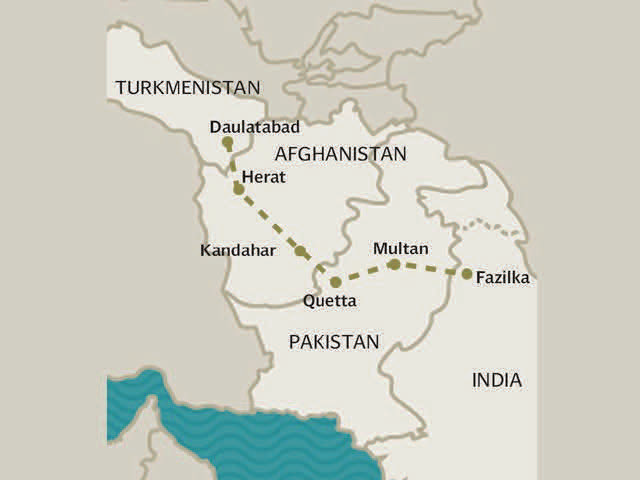 In a state regionally and politically divided, and with a government dependent upon network support structures, TAPI only provides the financial means and opportunities to expand this structure and to continue to fuel Pakistan’s security forces, further exacerbating issues relating to the representation and well-being of marginalized populations on the periphery. Furthermore, in the case of Afghanistan, the dangers of providing the Karzai government with a readily available and easily controllable flow of rent from gas transit revenue are even more pronounced. Karzai, though ineligible for re-election in 2014, assumes the position that his is a government under siege. Therefore, the way by which Karzai, already a figure whose election history is colored with accusations of widespread corruption, can guarantee the electoral victory of his successor would be to orient any rent possible to his, or his party’s, preferred candidate. …as long as the international community, including the Afghan government itself, makes “stability” an end goal and priority, the situation will not improve. However, this corruption is not exclusively internal. Foreign actors too, especially NATO members and those states bordering or otherwise affected by the security situation in Afghanistan, have every motivation, at least in a very short-sighted outlook, to encourage and facilitate the creation of a government by whatever means necessary, so long as the country is kept “stable.” At the end of April, this year, numerous global media sources reported heavily on the comments of Karzai and some US officials that the biggest contributor to corruption in Afghanistan is the United States itself. Once again, as long as the international community, including the Afghan government itself, makes “stability” an end goal and priority, the situation will not improve. Violence will inevitably continue if the underlying issues catalyzing instability are not addressed. The more money that is spent to consolidate the central government’s authority, craft temporary alliances, or to attempt to enhance the capabilities of Afghan security forces, the less capital will be available for investment into the universal, human development of the citizenry. Essentially, in all the above cases, the rent and economic assistance offered by the existence of a pipeline and increased gasification of the South Asian economies can only serve as an effective aid to genuine development if the priorities and policies regarding security, economy, political opposition, and regionalist movements, are fundamentally reevaluated. …the idea that TAPI will provide economic improvement that will assist the state in combating security threats and in turn lead to a maturation of democratic structures within the region is little more than a fairytale. Acknowledging the existence of these challenges, and the necessity to address them before any pipeline is constructed, commits policy makers to an admission of the fact that hydrocarbon resources cannot, without responsible management, aid in improving the economic or political conditions of a state. Furthermore, without consolidated, healthy political and economic systems, enfranchising of the entire population, a sustained peaceful environment will prove nearly impossible. Therefore, the idea that TAPI will provide economic improvement that will assist the state in combating security threats and in turn lead to a maturation of democratic structures within the region is little more than a fairytale. Such is the misconstrued understanding of what might be achieved through the construction of a pipeline. This is an unrealistic dream and, although gas supply agreements were signed a year ago and all parties to date confirm their commitment and financial investments into the project, it is feared that TAPI is an under-analyzed, premature project based upon overestimated, possibly figment, causal relationships between energy supply and genuine economic development and the possibility to establish a healthy state. With traditional notions of security being prioritized in Afghanistan and Pakistan (and even, to a certain extent, in Turkmenistan and India as well), there exist the potential incentives for central governments to utilize resource rents to further consolidate the power of the center, militarize their regimes, engage in clientalism, deliberately imbalance development to favor loyal constituencies and suppress, rather than engage, political opposition. Thus, without a legally bound regulatory framework which will ensure appropriate management of the project as well as the effective and beneficial employment of resource rent, it cannot be projected with confidence that TAPI will address the needs of the citizenry of South Asian states. And so, ultimately, there are potential long term solutions, founded upon a constructive political discourse involving all actors and the universal investment in human well-being, that are more in the interest of all parties than the current illusion of stability and economic growth, punctuated by a simmering violence and struggle which will eventually return to a boil. As this chapter of the narrative draws to a close, it is another’s task to decide what will happen next. Resources for the Future: Discussion Paper 03-13. Washington DC: April 2003. Hooman Peimani. “Politicking Over Central Asia’s Pipelines.” Journal of Energy Security. March 15, 2011. John Foster. “A Pipeline Through a Troubled Land: Afghanistan, Canada, and the New Great Energy Game.” Canadian Centre for Policy Alternatives: Foreign Policy Series, Volume 3, No. 1, June 19, 2008. Emily Horin. “Lifting the Pall Over Afghanistan’s 2014 Election: A Fresh Look at 2009.” United States Institute of Peace. May 2, 2013. Frederic Grare. “Balochistan: The State Versus the Nation.” Carnegie Endowment for International Peace. April 11, 2013. ← LNG: Why Can’t America Make the Export Decision?